One of the most affordable machines on the market, the Michley LSS-505 Lil’ Sew & Sew Multi-Purpose Sewing Machine with Built-In Stitches is prized by beginners from all over the world for its ease of use, price and efficiency. Ideal for sewers who are trying to stick to a budget, this sewing machine only costs between $30 and $60. 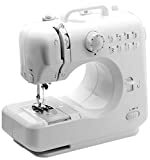 While it does lack the build quality and features of more advanced models, this machine still does a good job and does not compromise on sewing quality. Apart from the basic 8 stitch design, the Lil’ Sew & Sew boasts of forward and reverse sewing, hence enabling you to tighten your stitches and ensure that they don’t break apart. It includes a built-in LED light which is bright enough to illuminate the entire work surface. Best of all, this machine is extremely lightweight, which makes it exceptionally easy for you to carry it anywhere you want in the house, or outside the house. According to some users, this particular model does have a few drawbacks in terms of build and performance. A problem with the tension setting is often reported, although this is because users tend to forget to adjust the tension depending on the fabric’s thickness. Another customer also deplored the lack of a wide work surface, which, according to her, this made it problematic for her to work with larger fabrics. However, despite these few drawbacks, considering the Lil’ Sew & Sew’s amazing price it is still a great sewing machine for beginners. 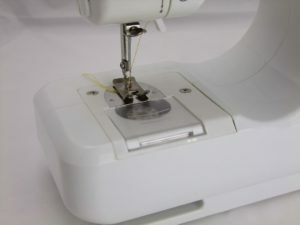 Overall mini sewing machines are great depending on your need – if you want a simple inexpensive machine to have around the house for mending or other lightweight projects; or if you need something portable that can be operated on batteries; or if you are truly a beginner and want to spend a small amount of money to try sewing. This sewing machine is top rated in many reviews and there are several helpful YouTube videos to guide users. The Michley LSS – 505 is suitable for use by crafters, sewing enthusiasts, and even campers have reported finding it useful for minor repairs on clothing and kit. Another plus is that the tension can be manually adjusted via a dial on the front of the machine. Users will also be pleasantly surprised to discover the twin needle capacity. Last, but by no means least, this sewing machine is considered a ‘no-oil machine’, making it completely hassle-free when it comes to maintenance. This machine is best suited to sewing light to medium weight fabrics. There is no button hole function and the machine only comes with one presser foot. One other con is that there are no seam guides on the needle plate. At 5.4 pounds, the Michley LSS-505 is easily among the lightest, most portable sewing machines on the market. Exceptionally lightweight, the machine easily fits even in the smallest corners of the house, which makes it quite easy on homeowners who are limited by space. In fact, it only measures 10.8 x 4.48 x 10.2 inches, which means that it can very easily fit on just about standard table. In spite of its exceptionally light build, the sewing machine does remain completely stable and does not move during lengthier sewing sessions. The Michley LSS-505 is so surprisingly easy to use that it’s often favored by budding sewers who are still learning the ropes. Indeed, this model is entirely mechanical, which is why it’s far easier to operate than computerized ones. This also makes it very easy for you to navigate through the different features. It comes with just the basic 8 built-in stitch designs. However, this will certainly provide beginners with enough variety to perform basic crafts and projects. 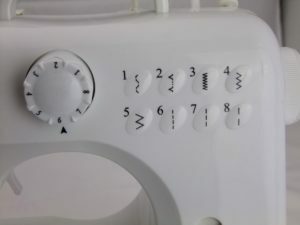 Best of all, since the machine is mechanical, users can simply turn the dial to navigate through the various stitch designs until they found the stitch of their choice. While it is certainly compact and less expensive than usual, the machine still comes with the necessary features to satisfy beginner users. 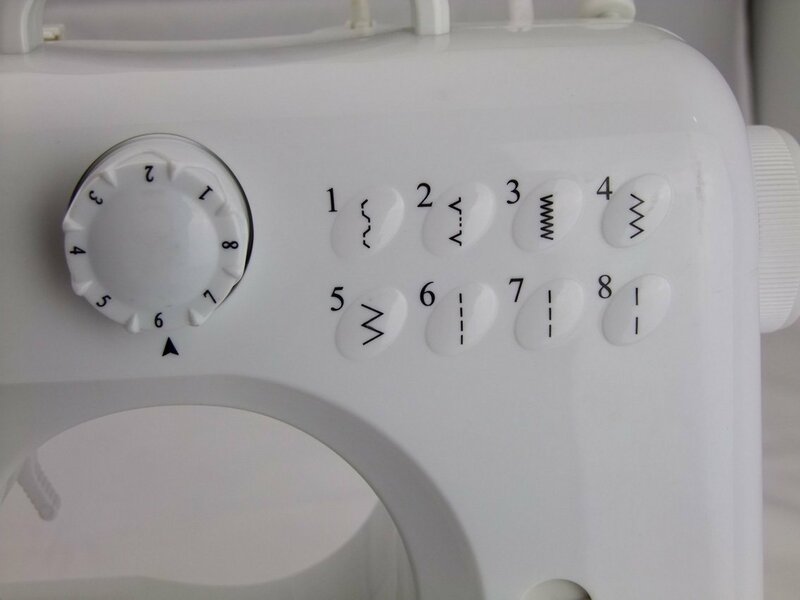 For example, it includes a double speed option that will allow you to sew an entirely stable and constant line of stitches, regardless of whether you’re sewing in reserve or forward. All the buttons are located on the right side of the machine, making it quite easy for you to access all the different options at the same time. The eight built-in stitches are also quite varied ad include 3 straight, 3 zigag, 1 blind hem and 1 scallop stitch. The machine also has different speed settings such as High- Off- Low button. As far as the tension is concerned, it can be easily adjusted through the dial located at the very front of the machine. Its free arm feature is another option prized by sewers because it enables you to access delicate and hard-to-access angles like sleeves, pant hems, collars, cuffs and the likes. The Lil’ Sew & Sew comes with a 3-piece feed dog which is ideal for beginners. According to the manufacturers, this apparatus operates best when used on fabrics that have a thickness of less than 3mm. Users also receive various accessories with the boxed packaging. These include extra bobbins, thread spools, extra needles, threader, foot pedal as well as an AC adapter. All in all, if you’re looking for a basic, low-maintenance sewing machine, you really can’t go wrong with the Michley LSS-505. Its price, coupled with its wide range of features will certainly provide surprisingly satisfactory results. If, however, you’re looking for a bit more variety, you could also take a look at the entry-level models Brother LS2125i and Singer 2277, which come with more stitch designs and sturdier frames. READ What Can I Make With a Sewing Machine?